I want to take a minute to thank you for voting in the So You Think You're Crafty competition. I didn't make it into the finals, but I made it a lot further than I thought I would- and I know that is thanks to my friends and followers! I got voted out the week before I got to share this project, so now I get to share it with you! I have to confess, I've never used RIT dye before. Never. Not once. So it was with much trepidation that I took on this project. But you know what? It was easy! So, don't be scared- give dye a chance! 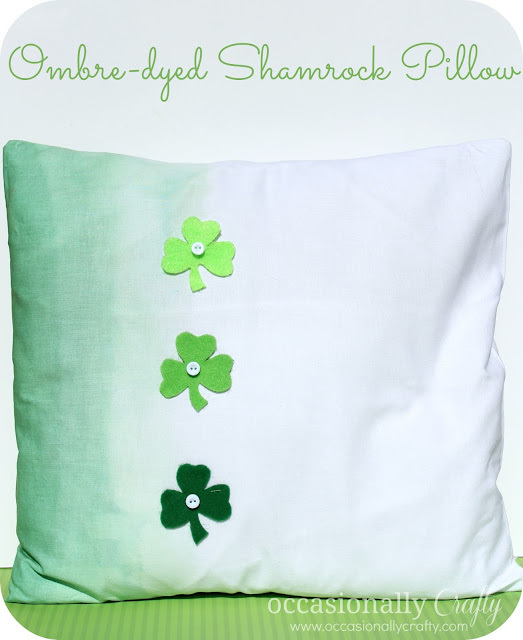 There's about a million things you can do with RIT dye, and I decided to jump on the "ombre" wagon for this Ombre-dyed Shamrock Pillow. I made the pillow cover out of white cotton using this tutorial for a simple envelope pillow cover. Really, this part couldn't be easier, even if you don't sew. Then, following the directions on the dye box (I used the powder kind- Kelly Green! ), I mixed up the magical solution using hot water, dye, and salt. When it was ready, I held my breath and began dipping. To get the ombre look, I followed the times on the picture below. As you can see, there wasn't a huge difference between three minutes and ten minutes, so I would probably change that next time. Once I was done dyeing my pillowcase I washed and dried it according to the directions, then stuffed my pillow form inside. 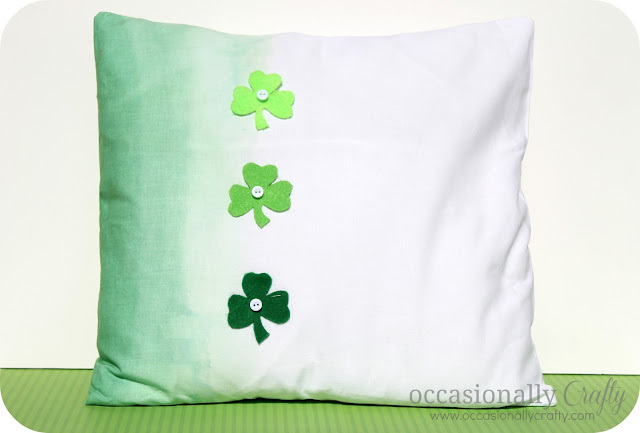 I finished off the look by cutting some shamrocks out off felt and gluing them to the pillow cover with fabric glue. I LOVE the way it came out- and now I want one for every holiday! Can you imagine shades of red with hearts for Valentine's? Or orange and black with pumpkins for Halloween? Once you start, you can't stop! I'll link this up to some of these parties this week: come check them out with me! 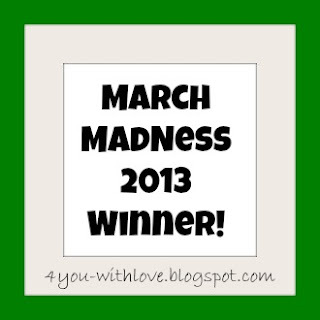 Update: Thanks for voting this project as a winner in the March Madness Party at 4 You With Love! This is so cute! I love how it turned out and it looks so easy. Would love for you to share this at my link party this week. How pretty. I haven't used dye before either but you've got the ideas flowing for me. May have to give it a try now. This is beautiful. I love how not only the pillow is ombre but so are your shamrocks....very clever! Thanks for sharing at March Madness! I just found your site and I am glad I did. This pillow is so cute. I like your idea of making them in different colors for different holidays. I can just see the Valentine pillow! I would love it if you would share this and any other crafts at my link party In and Out of the Kitchen. The party is live now and will run through Wednesday! I hope to see you there! 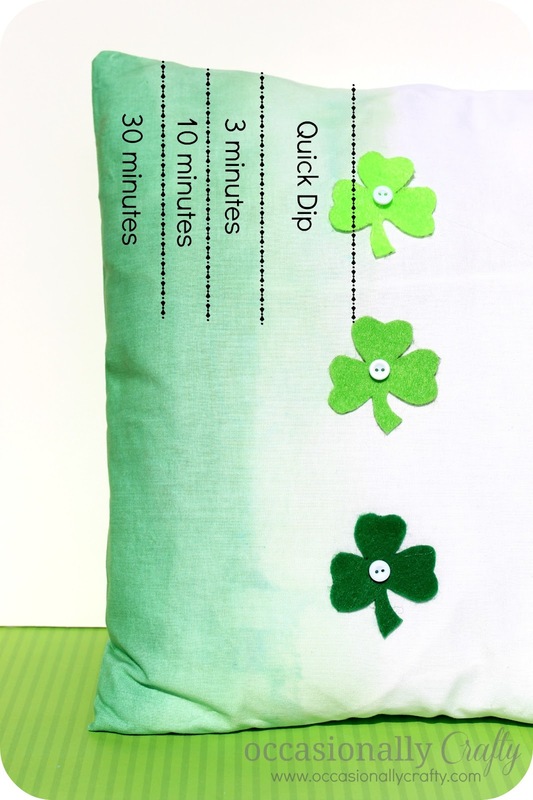 Oh I just LOVE this ombre pillow - so fun for St. Paddys and the ombre would look wonderful for any occasion! What a awesome idea! I love that you ombre'd the pillow case; can't wait to try this to something! :) You are a Featured Favorite this week on Saturday Show & Tell on Cheerios and Lattes! We loved having you join us last week and can't wait to see what you have been up to this week! Have a great weekend! Awesome tutorial! Thank you for sharing this in our Crafty Showcase! We love that you share with us. Your projects are inspiring!